This books make me want to sort the world into a billion lil piles. A fun read a like for the I Spy fanatic in your life. Various ways of sorting things: by color, by shape, by texture, etc. Copyright: 2017Number of Pages: UNKNOWNBook Format: HardcoverReading Level: Ages 3-7Genre: concept bookLit Requirement: Concept #2Summary:Sam need to clean up and so he sorts through his toys and other objects. He sorts by color, attributes and other categories. This book helps with the concept of sorting objects out and grouping with other objects like them.Response:I liked this book and the pictures are beautiful too. I liked that the objects being sorted were clear and you could see every object. This book is good if you are going to teach a child about how to sort items out. I would recommend this book to those who need to teach sorting. Cute book with lots of drawings. Lots of pages for counting things and sorting things by type, color, size, rhyme, etc. Sam's things are in a heap. In attempting to straighten things out he discovers how they are the same, how they are different and all the different ways of thinking about things. All of Sam’s toys are in a heap on his floor. It’s time for him to clean up. He finds one unique toy, then two dinosaurs, and counts upwards. But there are other ways to sort toys into categories. Maybe by what they are made from or their shape. And then there are the toys that fall into both categories. Some of them rhyme with each other. Others have the same pattern on them. They can be every color in the rainbow or have qualities that make them similar like being fuzzy or smelly. Some float. Others fly. So many ways to sort!Jocelyn has created a book that is all about the concept of sorting items into categories. Again and again, she shows that toys can be put into any number of categories. It’s all in how you look at them. The book also incorporates counting on some of its pages. It’s a book that is perfect for more conversations outside of the ones in the text. Questions of finding other toys that fit the new categories on the page, or even thinking of other categories that Sam hasn’t used yet. There’s plenty to be creative about here.Jocelyn’s illustrations are done in cut paper collage. Some items have a lovely depth to them, created by shadows on the page. On another two pages, there are shadows on the wall that add to the fun. On other pages real objects appear with drawings of others. This is a vibrant visual feast where children will want to look closely at the items and talk about how they match or don’t match.Have items on hand to sort to continue the conversations started with this creative look at sorting. Appropriate for ages 3-5. A good book for teaching the concepts of sorting and categories, with some creative and imaginative ways of grouping items, this book would be most useful in a classroom setting. I appreciate the book's utility, and the artwork is cool, but there is no real story beyond Sam sorting his 100 things in various ways. Not exactly compelling. Sam's belongings are in a pile in the middle of his room. He has to tidy up but he keeps getting distracted. Sam discovers patterns and things in common - by color, by size, by type, etc. No matter what though, Obo the robot is the best. I really liked the concept - great for teaching adjectives, patterns, and the idea of classifying things. The collage-like illustrations gave the items the sense of texture and makes the items more real and emphasizes the uniqueness of each item. As a library paraprofessional myself, all I could think of was that I could see Sam becoming a librarian in the future for his interest in classifying and organizing everything. Nevertheless, it's a fun and useful story for teaching. I received this book from Library Thing in exchange for my honest review.This book is busy. For children who can follow along well it is a great way to learn counting and sorting. For a child for whom so much going on is hard to grasp it may be difficult. Sam is a little boy whose room is a mess, as is often the case for young children when they have a lot of toys. He sets out to put things right. He sorts by colour, by category, and other ways that he thinks of. It is a good book to help learn some math skills. The illustrations are bright and interesting. Here's a clever concept book that takes the idea of categories to a whole new level. " Sam's things are in a heap. Time to tidy up. "Tidy up he does in wonderfully inventive ways. Not only is this a book to sit and explore but it invites kids to join in with their own contributions. I love Jocelyn's collage illustrations and page design. Sam is a ruffle-haired delight whose room ends up back where it started.Terrific book for a classroom and for repeated reading. Sam sorts was fun, and introduces a number of STEM concepts that I think could really be elaborated on by caregivers. I feel this title might encourage talking with a caregiver about concepts, but it is not demonstrated on the pages and that the inferred play isn't enough to put it in the play category for CLEL Bell. Do you have a child who likes to sort? Here's a book that is sure to create some fun. Sam has a heap of toys he needs to clean up and he sorts them into all kinds of categories! I think this would be a great book to pull out on those days when kids say, "I'm bored! There's nothing to do!" Make your own fun with your own stuff. 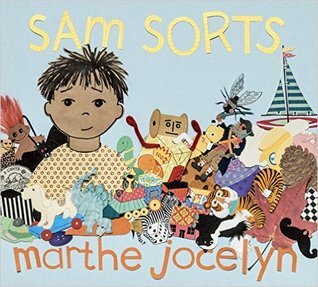 Read Sam Sorts by Marthe Jocelyn. What a great book about tidying up your room. Sam sorts everything into piles and then arranges all his toys in their place on his book shelf. By sorting his toys, time flies and the job is done. What a great way to demonstrate how to sort articles. Young readers will count along with Sam as he sorts through a pile of his favorite things. Bright illustrations will have children counting, and searching along with him for their favorite items. A wonderful book for ages three to seven to promote reading and math in a fun way. This is the most gorgeous, inventive, enjoyable counting and sorting book I have seen. Grab it if your little one wants to have a fun time practicing those skills in different creative ways and with lovely paper collage illustrations! An interesting concept book, but the amount of different concepts may be overwhelming and therefore unhelpful to the child reader. The collage illustrations are engaging. Matching, counting, shapes, sorting are all concepts Sam teaches children as he organizes his toys. As a kid who often played by sorting my toys into various categories, I really really related to this book. It spoke to the inner organizer in me :) Oscar liked it OK, too. I always recommend anything by Marthe Jocelyn. This is a excellent book for teaching children the concepts of Categories and Sorting, by color,design and more. An easy counting book with lots to look at. This is a unique book. Fun for one on one and teaching categories and then letting kids sort all sorts of things into their own categories. Good for classrooms, I'd imagine. Would be the perfect read aloud for a preschool class, where sorting and classifying are part of the Utah Core Standards. Marthe Jocelyn - Canadian born22 books published for young readers"